I won’t lie. After making last week’s pizzettes, I had an abundance of leftover tofu ricotta that was so delicious, I spent some time trying to come up with another easy, tasty dish to use it in. 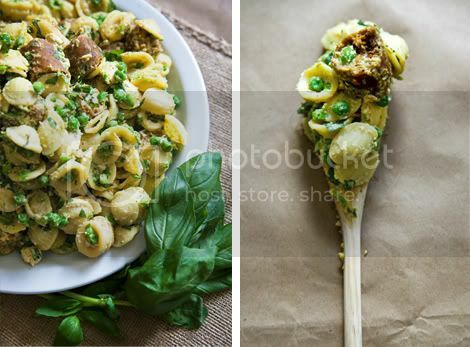 Enter my veganized version of Giada DeLaurentiis’ Tagliatelle with Smashed Peas, Sausage and Ricotta Cheese: Orecchiette with Smashed Peas, Hot Veggie Sausage and Tofu Ricotta. 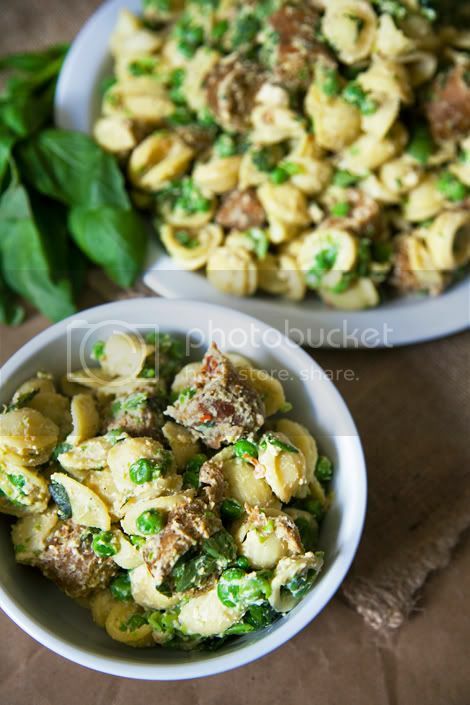 I chose to use orecchiette instead of tagliatelle — fresh orecchiette is never made with eggs — and substituted spicy Tofurky Italian Sausage for regular Italian sausage. 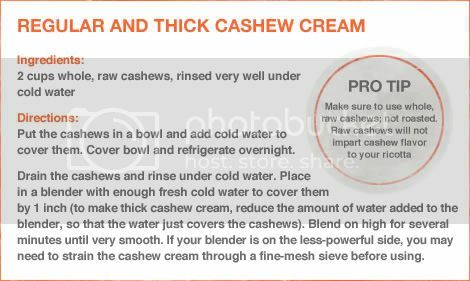 Cashew Cream is the secret ingredient in the homemade tofu ricotta, and I was truly amazed by this flawless alternative for dairy ricotta. Prepare the ricotta: Place all of the ingredients in a food processor or blender and pulse until the mixture has the texture of ricotta cheese. Transfer to a bowl and refrigerate until ready to use. Cook the orecchiette: Bring a large pot of water to boil over high heat. Salt the water with two tablespoons of kosher salt and add the pasta. Cook until al dente, stirring occasionally, 8 – 10 minutes. Drain, reserving 1 cup of the pasta cooking water. Meanwhile, prepare the sausage and peas: In a large heavy skillet, heat olive oil and garlic over medium-high heat and add the veggie sausage. Use a wooden spoon to break up the sausage into bite-sized pieces. When the sausage has browned, remove and set aside in a small bowl. Add the peas to the pan and using the back of the wooden spoon, smash them. Turn off heat. Add the tofu ricotta along with the cooked pasta to the peas in the pan, and toss to coat, adding reserved pasta water in 1/4 cup additions if needed. Return sausage to pan. Add the basil, nutritional yeast and salt. Toss gently to coat. Serve immediately. To view Giada's non-vegan recipe for Tagliatelle with Smashed Peas, Sausage and Ricotta Cheese, visit foodnetwork.com.